The Red Shoelace Killer on sale now at Audible! 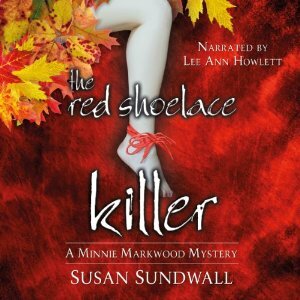 Lee Ann is pleased to announce that her latest recording, a cozy mystery called The Red Shoelace Killer by Susan Sundwall, is now on sale on Audible. This book is the first in the Minnie Markwood Mystery series. Minnie Markwood can out-sleuth Miss Marple any day of the week – in her imagination. But when a real killer begins to target Minnie and her young sidekicks, reality trumps imagination big time. Who’s buying up all the red shoelaces at the mall and stalking a cashier? Is it the killer who terrorized Minnie on the highway and kidnapped her coworker? It soon becomes frighteningly clear that Minnie’s onto something, and The Red Shoelace Killer’s days are numbered. Join in the fun and listen to a sample/purchase the book here. Posted by lahowlett on March 24, 2014 in Uncategorized and tagged Audible, audiobooks, cozy mystery, fiction, mystery, Susan Sundwall, The Red Shoelace Killer. Hi, Lee Ann. Thank you for doing such a wonderful job with the book. You are an outstanding professional. Five stars from this author! Thanks, Susan! I really enjoyed your story so I had great material work with!